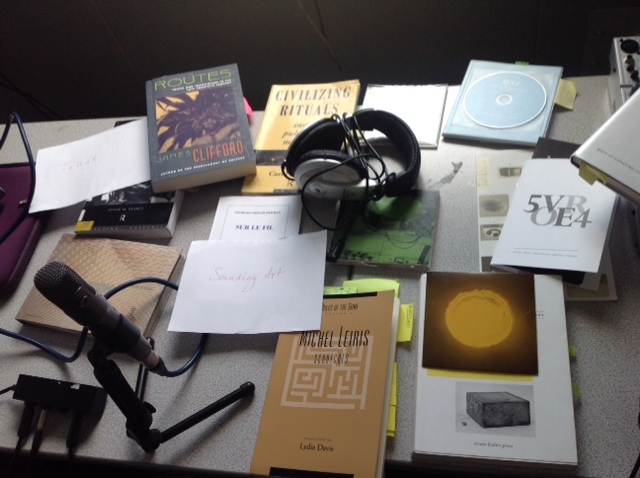 Ora 11 … Curating Sound? The 11th episode of Ora was recorded in the Electronic Music Studios at Goldsmiths College, University of London after Day 2 of the Sound Art Curating conference jointly staged by Goldsmiths and the Courtauld Institute in London between 15 and 17 May. Daniela Cascella and Salomé Voegelin are joined by Christof Migone to discuss sonic somatic curating and uncurating; and to pursue curating collections, memories and rituals into writing. The three voices propose, probe and envisage spaces for collective action, for claiming back listening through a questioning of formats and canons. Some of our Ora podcasts are hosted this week by R H A D – FM 101,6, Radio Hopes and Dreams, an artist-run radio station by Elin Vister and Margrethe Kolstad Brekke, currently broadcasting from the Bergen Kunsthall in Norway.